Like scenes witnessed through passing windows at night, these fifty stories reveal love and lives realized and destroyed, the mundane terrors and desires of modern life, loneliness, heartache, and hard-won redemption. Through sprawling cities to small desert towns, the players in each tale are you and I, your friend, your enemy, all of us just actors in minuscule films any stranger passing by may see and experience, and perhaps remember for the rest of their lives. From the author of What Lies In Wait and The Cards We Keep, these flashes of fiction explore the strange and desolate landscape of humanity's desire for comfort, for communion, or for something just a little more. From Unknown Press, this full-length collection of narrative poetry explores the childhood memories and nostalgic daydreams of a grade-school bookworm now grown up to face cancer, debt, solitude, and the fear that all the joys and hopes of a bygone youth are slipping out of reach. Named the "Best Book of 2017" by literary website Drunk Monkeys, this collection is available at Amazon and by special order through your local bookseller. Note from the author: I'd like to thank Bud Smith and Devin Kelly at Unknown Press for their incredible editorial guidance and creative insight, and Alicia Frehulfer for allowing me to use her gorgeous painting for the cover. This poetry collection weaves in and out of San Antonio nights, each soaked with neon lights, hard liquor, and the pained, lost, hopeful, suicidal, and redemptive population of dreamers stalking the streets. The book is part of the Punk Chapbook Series by Epic Rites Press. In the tradition of Ray Bradbury and Stephen King, these stories explore the unexpected and strange, the whimsical and nostalgic, the eerie and gruesome, sixteen tales of lives forever changed by simple choices and small mistakes, ordinary people unaware they are crossing the point of no return, leaving the common world for a realm of the unknown. From eerie ghost stories to lighthearted runaway tales, these stories explore the entire spectrum of what happens when we confront ... what lies in wait. A special thank you goes out to Alexandra Soman for the cover image “but your ghost I will gladly bear.” Visit her work at www.psycheanamnesis.deviantart.com. Berlin is now available from Maverick Duck Press! From New York to Berlin and back, these poems chronicle the romance, intrigue, sadness, humor, and brooding wintertime nostalgia of the people and places of Berlin—a city like no other. Walk along the Spree as snow falls on cobbled streets, drift from lamppost to lamppost at night as WWII-era ghosts fly overhead, and stroll beneath the lights of the Ku'damm with actresses, bus drivers, and policemen as the glowing cafes call out with promises of coffee and warmth. This is Berlin. A special thanks goes to Ryan W. Bradley for designing the cover. 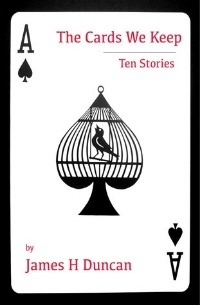 From crooked detectives to boxcar hobos; from desperate bounty hunters to disgraced celebrities; from small-town doldrums to haunted marriages—these ten stories explore the strange and uncertain, the deadly and the lonesome, looking deep into the aching reflections of the choices we’ve made, the cages we’ve created, the secrets we’ve buried, and at the ace cards we’ve tucked away into our sleeves during the long and dangerous card game of life...waiting for that moment when we’ll need them the most. 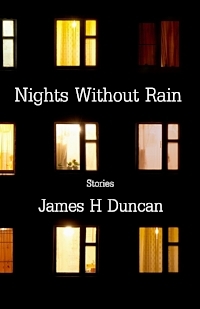 This split-author poetry chapbook features James H Duncan, John Dorsey, and Mat Gould. The Darkest Bomb, Duncan's mini-chap, examines the ending that waits for us all and the millions of paths we take to reach that final explosion of nothingness, the darkest bomb. You can find a sample poem by clicking HERE. You can obtain copies directly from the publisher's website, Dog On A Chain Press, or from Amazon.com. This full-length collection combines new poems with the best of Duncan’s work published between 2005 and 2012—a span in which his poetry appeared in more than sixty print and online journals and in five small-press chapbooks. The following poetry chapbooks are only available through the author or are out-of-print.